Every culture seems to have tales of little people such as elves, pixies, sprites, brownies, goblins, gnomes, leprechauns and many other forms of nature spirits. 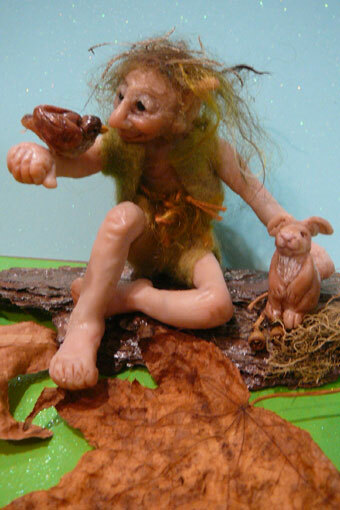 Musing on the theme this little wood elf and his friends were revealed. This is a work in polymer clay, a medium that I had only relatively recently experimented with and was fortunate to have several lessons with Amanda Day from Twin Essence. Sculpting was a wonderous adventure. Shortly after, Jennifer McCormack of Lavendilly House, showed me how to needlefelt. The polyclay experience helped immensely but it is fibre as a medium that has entranced and stolen my heart. Although the polymer clay experience has been very profound, and I may yet go further with it, the fired piece can be fragile and crack even some time after firing and appearing to be intact. This worried me a lot so I was not altogether confident using the material. There have also been some concerns about safety because of the use of thalates in the raw material although the formula is now being changed. After working on Jack Frost I wondered who might next emerge. It was this little fellow. Another wood elf. He has a needlefelted face. His body has a wire armature, like the polymer clay figure, but this one is wrapped in fleece instead of aluminium foil and masking tape. 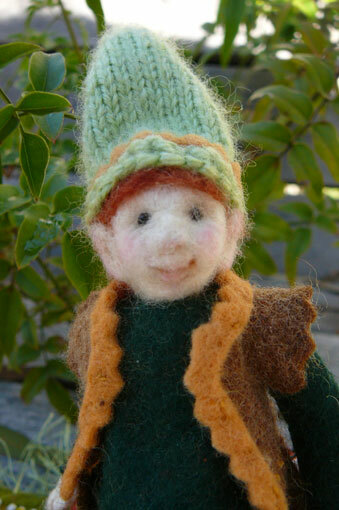 His clothes are made from wool felt and handstitched. His cap is knitted and I had to work out my own a pattern. Extremely delighted that it worked on the first go of casting on stitches and improvising. The acorns in the felt forest setting have real acorn caps and needlefelted acorns. The felt oakleaf is lifesize to match the scale of the acorns. I hope that somewhere in every forest, watching over and repairing the damage we humans inflict, there are still these tiny guardians. He is just divine Christine….can’t wait to see what you make next!